Ed Sadowski was a right-handed-hitting catcher who played in 217 major-league games in five seasons between 1960 and 1966. He played for the Boston Red Sox (1960), the Los Angeles Angels (1961-1963), and the Atlanta Braves (1966). Despite his brief major-league career, Sadowski had the distinction of playing for both the Los Angeles Angels and the Atlanta Braves in their inaugural seasons. Sadowski was the eldest of a trio of big-league baseball-playing brothers. His youngest brother, Bob Sadowski (born 1938) pitched for the Milwaukee Braves (1963-1965) and the Boston Red Sox (1966). Ted Sadowski (born 1936), the middle ballplaying brother, who died on July 18, 1993, pitched for the Washington Senators (1960) and the Minnesota Twins (1961-1962). A nephew, Jim Sadowski (born 1951), pitched in four games for the Pittsburgh Pirates in 1974. Sadowski attended St John’s Lyceum High School, where he was the first of three Sadowski brothers to excel on Lyceum’s baseball diamond. Sadowski’s “first love” at St. John’s Lyceum, he said in a 1959 interview with The Sporting News, was basketball, a sport in which he was skilled enough to receive a scholarship offer from the University of Notre Dame. Instead of playing college basketball in South Bend, Sadowski accepted a scholarship to study engineering at the Carnegie Institute of Technology (later Carnegie-Mellon University). After one year of college, Sadowski left school to pursue a professional baseball career.2 In 1950 he signed on with the independent Radford (Virginia) Rockets of the Class D Blue Ridge League, beginning his decade-long journey through the minors. The following year, Sadowski was acquired by the Boston Red Sox organization and was assigned to the Marion (Ohio) Red Sox of the Class D Ohio-Indiana League. The young catcher had an excellent season at the plate for Marion in 1951, batting .308 in 125 games. Over the next few seasons, Sadowski’s minor-league career stagnated. During the 1952 and 1953 seasons, the Red Sox reassigned him six times. While Sadowski’s available fielding statistics from the 1952 and 1953 seasons indicate that he performed solidly behind the plate, he struggled as a hitter against higher-level minor-league pitching. Sadowski was in military service during the 1954 and 1955 seasons. He returned to baseball in 1956 with the Red Sox-affiliated San Francisco Seals of the Open Classification Pacific Coast League. He shared duties behind the plate for the 1956 Seals with future Red Sox player and team owner Haywood Sullivan. Sadowski displayed some power for the Seals, hitting seven home runs in 213 at-bats in 1956. He continued to platoon catching duties with Sullivan for the Seals in 1957. His hitting numbers remained steady that season: .245 average, 7 home runs, and 38 RBIs in 108 games. Sadowski made his major-league debut for the Red Sox on April 20, 1960, in a Wednesday afternoon contest in Boston’s third game of the season at Fenway Park against the New York Yankees, entering as a defensive replacement for an injured Haywood Sullivan after the first inning. Sadowski batted eighth and went 1-for-3. In the second inning, he walked on his first major-league at-bat against Bob Turley and later scored on a sacrifice fly by Don Buddin. Sadowski got his first career hit and RBI in the seventh inning with a two-out double off Art Ditmar that drove in Pumpsie Green with an insurance run for the Red Sox in their 7-1 victory. Sadowski spent the first half of the 1960 season on the Red Sox roster, backing up Russ Nixon. The 29-year-old rookie was assigned the number 8, making him the last Red Sox player to wear that number before Carl Yastrzemski did. The right-handed-hitting Sadowski started primarily against left-handed pitchers since Nixon batted left-handed.5 Sadowski spent time on the 15-day disabled list in May with a broken index finger. He returned to active duty on May 29, catching both games of a doubleheader against the Baltimore Orioles.6 As a backup, Sadowski played in 38 games, hitting .215 with 3 home runs and 8 RBIs. In July the Red Sox sent him back to the minors, loaning him to the Los Angeles Dodgers Triple-A affiliate, the Spokane Indians of the Pacific Coast League, for the remainder of the season. Sadowski fell to third on the Angels’ depth chart in 1962 behind Averill and the new starting catcher, 23-year-old Buck Rodgers. The Angels made a concerted effort to add youth to their roster, relegating Sadowski (age 31) to a peripheral role.9 Sadowski played in only 27 games that season. In 1963 he figured more prominently in the Angels’ catching platoon, serving as Rodgers’ backup for the whole season. He excelled defensively in 1963, making only one error in 68 games behind the plate. Sadowski’s outstanding catching performance was tempered by his weak hitting. He hit .172 with 4 home runs and 15 RBIs in 174 at-bats. (One of his teammates on the Angels that year was Bob Sadowski, a utility player to whom he was unrelated but who happened to have the same name as Ed’s brother. 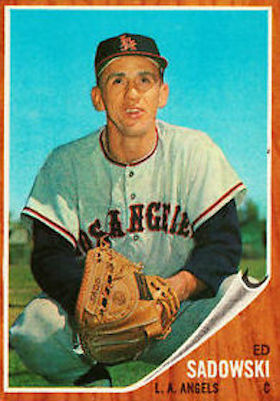 In 1964 the Angels assigned Sadowski to Triple-A Hawaii. He shared the starting catcher’s duties with future major leaguer Jack Hiatt. After the season, the Milwaukee Braves acquired Sadowski from the Angels and assigned him to their International League affiliate in Atlanta, where he spent 1965 as the backup catcher to Bob Barton in the final season of the Triple-A Atlanta Crackers. When the major-league Braves replaced the Crackers in Atlanta Stadium in 1966, Sadowski was sent to the Braves’ Triple-A club as it shifted to Richmond, Virginia, where he again was a reserve catcher – this time backing up Chris Cannizzaro. Near the end of their inaugural season in Atlanta, the Braves called up Sadowski. He played in the Braves’ last three games of the season. In the first game of an October 1 doubleheader against the Cincinnati Reds, Sadowski had a pinch-hit RBI single off Milt Pappas in the eighth inning and later scored on a single by Mack Jones. Sadowski caught the second game of the doubleheader at Crosley Field as well, going 0-for-5 in a 6-3 victory. The next day Sadowski caught the final game of the Braves’ season, a 4-2 victory over the Reds. At the plate, he went 0-for-3 with a walk. It was his final major-league appearance. Released after the season, Sadowski retired as a player. After the 1971 season, Sadowski left professional baseball and moved to Garden Grove, California, with his wife, Theresa, and their four children. He worked for many years as a physical-education teacher at Catholic schools in Orange County, including Saint Anne School in Santa Ana and St. Columban’s School in Garden Grove. Sadowski died at the age of 62 on November 6, 1993, after a long battle with amyotrophic lateral sclerosis, Lou Gehrig’s Disease.11 He is buried in Holy Sepulcher Cemetery in Orange, California, alongside Theresa, who died in 1996. 1 Jim Wudarczyk, “The Ethnic Experience in Lawrenceville,” Lawrenceville Historical Society, lhs15201.org/articles_b.asp?ID=18. 2 Bob Holbrook, “Higgins Beaming Over BoSox’ Big Backstop Derby,” The Sporting News, March 4, 1959: 8. 3 Ibid. Hy Hurwitz, “Sadowski’s A-Plus Report Card Clears Bosox Backstop Picture,” The Sporting News, January 13, 1960: 7. Hurwitz, “Nixon Deal Gives Red Sox Another Southpaw Hitter,” The Sporting News, March 23, 1960: 13. 5 Hurwitz, “Nixon Deal.” Hurwitz, “Opportunity Knocks; Sullivan Handed Job as Top Hub Backstop,” The Sporting News, March 30, 1960: 8. Hurwitz, “Sadowski Catches Twin Bill,” The Sporting News, June 8, 1960: 7. 7 Hy Hurwitz, “New Clubs Pleased at $4 Million Picks,” The Sporting News, December 21, 1960: 3. 8 Braven Dyer, “Return of Yost Plugs Two Big Angel Gaps at Plate, on Defense,” The Sporting News, June 14, 1961: 20. 9 Braven Dyer, “Angels to Focus Spotlight on Kids – Average Age 25,” The Sporting News, December 20, 1961: 25. 10 Ted Blackman, “Eight Playing Winter Ball,” The Sporting News, January 4, 1969: 47. Charley Feeney, “Maz Hits Water to Toughen Land Legs,” The Sporting News, March 7, 1970: 8. 11 “Ex-Angel Sadowski dies of ALS at 62,” Orange County Register, November 9, 1993.